One of my favorite childhood comfort foods is Korean/Japanese-style curry. K/J style curry is distinct from Indian curry in that it's usually a bit sweeter with often slight fruit undertones. There's just something comforting about a creamy bowl of curry with bite-size, tender pieces of meat, carrots, and potatoes. You may choose to make your own homemade curry roux from scratch, but I decided to use the Japanese curry roux blocks that Nami from Just One Cookbook recommended! These roux blocks are so convenient, and they come in varying spice levels, so you can choose one that matches your tastes. Although you may technically just stir the roux blocks into boiling water and have a bowl of curry, I decided to add more depth of flavor by adding various layers, such as ketchup and soy sauce. As Nami brilliantly suggested, this recipe also involves adding coarsely grated apple to the curry, and this imparts a hint of sweetness that permeates throughout. The heat softens the apples, so do not worry- you won't have crunchy chunks of apple, but rather soft slivers that contribute to the creaminess of the curry. When I make curry, I like to make a huge pot, and enjoy it over several days; you could choose to microwave it, but I prefer to slowly re-heat the pot on low heat, stirring constantly, and adding more water to thin it out if necessary. Every time I make curry, I think of one of my closest friends, who used to make a huge batch and eat it for weeks during college. One day, when I had stopped by his apartment, he was making a huge potful to eat for dinner. He offered me some, but since I had already eaten, I gratefully declined. When I stopped by his place about 3 weeks later, he asked if I had eaten dinner, and told me he had some curry in the fridge if I was hungry. I asked if it was the same batch he made a few weeks before, and he nonchalantly said it was so. Needless to say, I declined the offer.... I guess my friend's immune system is pretty strong, because he always liked to push the limits of expiration dates, but I'm afraid my stomach isn't as strong as his... So, if you wish to make a huge batch, you may keep it in the fridge and enjoy it for about 3-5 days, but I wouldn't recommend it too much longer past that! Anyways, hope you enjoy the recipe! 1. Peel and dice the potatoes into bite-sized chunks. Soak the potatoes in a bowl of lukewarm water and let them sit for 15 minutes to help break down the starch. 2. Cut the onions into wedges. Peel and cut the carrot into bite size chunks (I used the Rangiri/ rolling wedges method; Make a diagonal cut, make a quarter turn, and make another cut; the carrots will be of a pyramidal shape. Refer to this [link] for more detailed instructions). Mince the ginger. 3. 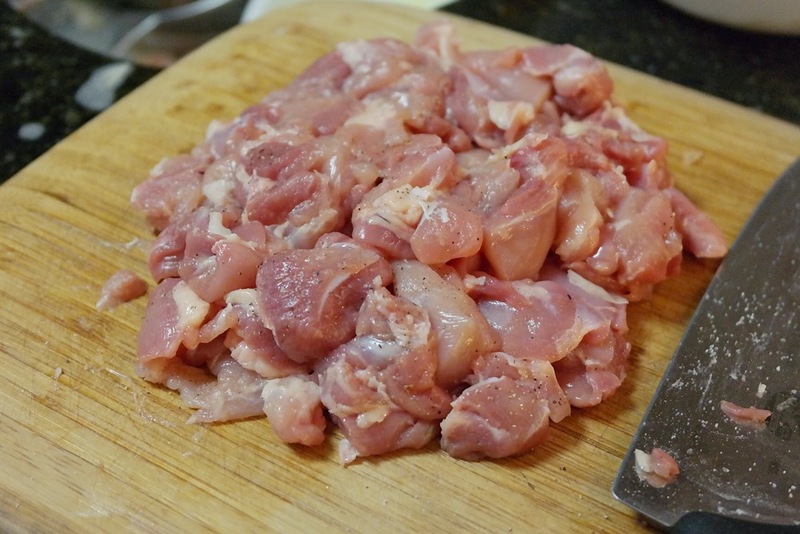 Cut the chicken into bite size pieces and season with salt and black pepper. 4. Heat the oil in a large pot over medium heat, and add the onions. Sauté for a few minutes until the onions become translucent (about 3-4 minutes). 5. Add the ginger, garlic, and chicken. Cook for 5-7 minutes, stirring occasionally, until the chicken is no longer pink in color. 6. Add the carrots and stir. Add the water to the pot, and bring to a boil. 7. Using a spoon, remove the scum and excess fat that rises to the surface. 8. Peel the apple and coarsely grate it directly into the pot. 9. Add the honey and salt to the pot, and simmer on medium heat for 20 minutes, uncovered. 10. Add the potatoes to the pot, and cook for 15 minutes, or until the potatoes are tender. 11. Remove the pot from heat, and add the curry roux, 1 block at a time. After adding each block, stir well to make sure that it is completely dissolved. 12. Add the soy sauce and ketchup (and tonkatsu sauce and/or Worcestershire sauce if you wish). Simmer on low heat, uncovered, stirring frequently, until the curry thickens. Enjoy! Serve over a bowl of rice, and add a soft-boiled egg or an omelet to the plate if you wish!